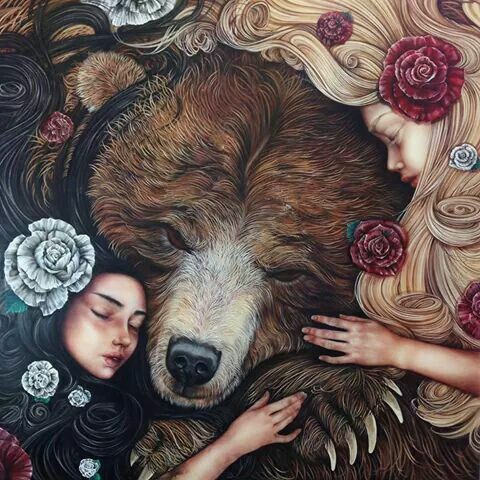 Every night, Snow White and Rose Red waited for the bear to come out of the wild and lay down at their hearth. They both loved him in their own way, although they only half-knew it at the time. The half of them that swept their mother's cottage floors and read school books was innocent. The half that cast aside aprons and ran in the sunlit woods, the watchful shadowy woods, understood. It heard the new drum of their blood. It felt the tiny fires in their palms, their throats. Snow White prepared soft blankets for the bear, plumped cushions, made food. Rose Red burned pinecones in the hearthfire so he would dream of his forest home. Snow White lit candles and memorised classic poems to share. Rose Red gathered into herself the silences she had heard and loved in the deepest wood, beneath the palest moons. Snow White saw the wit in the bear's honey-coloured eyes and the gold beneath his fur, at his heart. Rose Red smelled the musk and pine-bark on him and felt the warm strength within his arms. And so time passed, and the girls had adventures - strange forest, wicked dwarf - as girls should do, growing up. The wild part of them was drawn over and again to the dwarf; the innocent part kept trying to help him despite his wickedness. In the end, he betrayed them, which happens too often to girls, growing up. His servant was the bear they loved. Kill them! he ordered the bear. And the bear reared up. But he loved those girls as much as they loved him ... he loved Snow White's gentle careful kindness, and Rose Red's dreaming alluring tenderness ... and the dwarf was a cruel master. So he struck the dwarf, killed him, instead of the girls. All at once the dwarf's wicked magic died with the dwarf himself, and the bear was transformed! His furred skin fell away, revealing a handsome, gold-clad prince. Long had he been captured and transformed by the dwarf, and he'd despaired of his existence until two girls let him into their house and their hearts. Snow White embraced the prince in her joy. But Rose Red sank to her knees by the discarded bearskin, weeping. And as her tears fell on fur and claw, they began shifting. Shadows grew, birds fell silent, and the dwarf's wicked magic kept unravelling. For he had not only transformed the prince into a bear, but a bear into a prince. Now, at last, that bear regained its own shape, warm and brown, wild and strong. And it embraced Rose Red in its joy. Snow White and her prince went away to his castle, where they were married within a golden chamber decked with embroidered velvet flags. When the old king died, they ruled the land with care and kindness. Rose Red and her bear went away into the forest, where they were married in a sunlit glade strung with leaves and roses. They ran the trackless tree-realm, living for dreams and love's tenderness. Their mother stayed on in her cottage, and at the full moon Snow White visited her, and at the dark moon Rose Red visited her, and she lived happily ever after. I adore this version of things...thank you for finding a way to see them both happily ever aftered. Just beautiful, thank you. And the illustration is gorgeous too.